Some patients described it as Parkinson's, Alzheimer's and motor neurone disease rolled into one. Peter Allen, 51, is in the early stages of Huntington's and took part in the trial: "You end up in almost a vegetative state, it's a horrible end." Huntington's blights families. Peter has seen his mum Stephanie, uncle Keith and grandmother Olive die from it. The three siblings have eight children - all young adults, each of whom has a 50-50 chance of developing the disease. The unstoppable death of brain cells in Huntington's leaves patients in permanent decline, affecting their movement, behaviour, memory and ability to think clearly. Peter, from Essex, told me: "It's so difficult to have that degenerative thing in you. "You know the last day was better than the next one's going to be." Huntington's is caused by an error in a section of DNA called the huntingtin gene. Image caption Prof Sarah Tabrizi , from the UCL Institute of Neurology, led the trials. Prof Sarah Tabrizi, the lead researcher and director of the Huntington's Disease Centre at UCL, told the BBC: "I've been seeing patients in clinic for nearly 20 years, I've seen many of my patients over that time die. "For the first time we have the potential, we have the hope, of a therapy that one day may slow or prevent Huntington's disease. "This is of groundbreaking importance for patients and families." Peter, Sandy and Frank - as well as their partners Annie, Dermot and Hayley - have always promised their children they will not need to worry about Huntington's as there will be a treatment in time for them. Peter told the BBC: "I'm the luckiest person in the world to be sitting here on the verge of having that. They will set out to show whether the disease can be slowed, and ultimately prevented, by treating Huntington's disease carriers before they develop any symptoms. Prof John Hardy, who was awarded the Breakthrough Prize for his work on Alzheimer's, told the BBC: "I really think this is, potentially, the biggest breakthrough in neurodegenerative disease in the past 50 years. "That sounds like hyperbole - in a year I might be embarrassed by saying that - but that's how I feel at the moment." The protein synuclein is implicated in Parkinson's while amyloid and tau seem to have a role in dementias. Prof Giovanna Mallucci, who discovered the first chemical to prevent the death of brain tissue in any neurodegenerative disease, said the trial was a "tremendous step forward" for patients and there was now "real room for optimism". 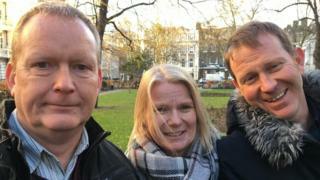 She told the BBC: "The case for these is not as clear-cut as for Huntington's disease, they are more complex and less well understood. "But the principle that a gene, any gene affecting disease progression and susceptibility, can be safely modified in this way in humans is very exciting and builds momentum and confidence in pursuing these avenues for potential treatments." The therapy was developed by Ionis Pharmaceuticals, which said the drug had "substantially exceeded" expectations, and the licence has now been sold to Roche.